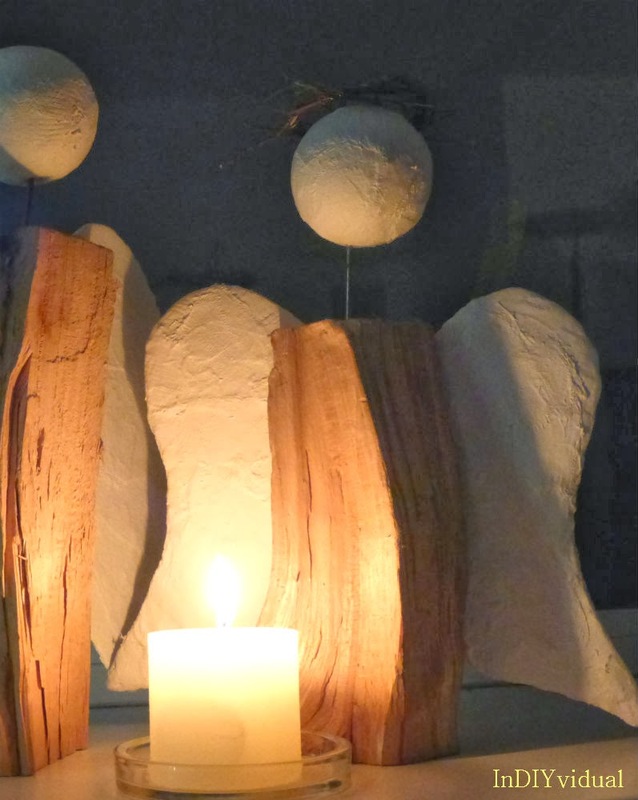 Three or four years ago, there were some log angels shown in a German magazine called Landlust. Every crafty German wanted to do them ( so the plaster bandages in most crafts shops and even farmacies were sold out, to the farmacists great astonishment). These are very easy to make, you take a log, cut out a pair of cardboard wings, cover them in plaster bandages, nail them to the log, take a styrofoam ball, cover it in plaster bandages, nail a large nail into the log as a neck and press the ball on top, and then you make a tiny wreath out of branches and stuff as the halo (wuw... loooong breath). My mom wanted some. This close to christmas, she didn´t really have any time, so I made her three. Family and friends saw them, fell in love and wanted some, too. So I did some. And some more. I think I have created about thirty of these in the last years. I said it was very simple, didn´t I? Well it is, but did you read the part about covering everything in plaster bandages? You have to really rub it in and do a couple of layers. So on your ninth angel of the evening, your fingers are pretty much dried out and rubbed raw. I have new orders for this year. And I decided: if I am doing this again, I will at least I make my own, too! What do you do ´every year again`?